Finding Nemo is a 2003 American computer-animated family film produced by Pixar Animation Studios and released by Walt Disney Pictures. Written and directed by Andrew Stanton with co-direction by Lee Unkrich, the film stars the voices of Albert Brooks, Ellen DeGeneres, Alexander Gould, and Willem Dafoe. It tells the story of the overprotective ocellaris clownfish named Marlin who, along with a regal blue tang named Dory, searches for his abducted son Nemo all the way to Sydney Harbour. Along the way, Marlin learns to take risks and comes to terms with Nemo taking care of himself. Finding Nemo was released on May 30, 2003, and has received universal critical acclaim since. The film won the Academy Award for Best Animated Feature, and was nominated in three more categories, including Best Original Screenplay. Finding Nemo became the highest-grossing animated film at the time and was the second highest-grossing film of 2003, earning a total of $871 million worldwide by the end of its initial theatrical run. The film is the best-selling DVD title of all time, with over 40 million copies sold as of 2006, and was the highest-grossing G-rated film of all time before Pixar's own Toy Story 3 overtook it. The film was re-released in 3D in 2012. In 2008, the American Film Institute named it the 10th greatest animated film ever made as part of their 10 Top 10 lists. In a 2016 poll of international critics conducted by BBC, Finding Nemo was voted one of the 100 greatest motion pictures since 2000. A sequel, Finding Dory, was released on June 17, 2016 in the United States. Two ocellaris clownfish, Marlin and Coral, admire their new home in the Great Barrier Reef and their clutch of eggs when a barracuda attacks, knocking Marlin unconscious. He wakes up to find that Coral and all but one of the eggs have been eaten by the barracuda. Marlin names this last egg Nemo, a name that Coral liked. Following his birth, Nemo develops a smaller right fin due to damage to his egg, which limits his swimming ability. Worried about Nemo's safety, Marlin embarrasses Nemo during a school field trip. Nemo disobeys his father and sneaks away from the reef towards a boat, and is captured by scuba divers. As the boat departs, a diver accidentally knocks his diving mask overboard. While attempting to save Nemo, Marlin meets Dory, a good-hearted and optimistic regal blue tang with short-term memory loss. Marlin and Dory meet three Australian sharks – Bruce, Anchor and Chum. Although Marlin is initially intimidated by the sharks, it soon becomes evident that they are vegetarians taking them to a meeting. At the meeting, Marlin discovers the diver's mask and notices an address written on it. When he argues with Dory and accidentally gives her a nosebleed, the blood causes Bruce to lose control of himself and enter a violent feeding frenzy. The pair escape from Bruce, but the mask falls into a trench in the deep sea. During a hazardous struggle with an anglerfish in the trench, Dory sees the diving mask and reads the address located at 42 Wallaby Way, Sydney. As Dory finishes reading the address on the mask, Marlin is able to trap the Anglerfish using the eyepiece of the mask. To her own disbelief, Dory is able to remember the address on her own despite her short-term memory loss. The pair swims on, receiving directions to Sydney from a school of moonfish. Marlin and Dory encounter a bloom of jellyfish that nearly kills them. Marlin loses consciousness and wakes up on a sea turtle named Crush, who takes Marlin and Dory on the East Australian Current. Marlin tells the details of his long journey with a group of sea turtles, and his story is spread across the ocean. He also sees how Crush gets along well with his son Squirt without being over-protective of him. Meanwhile, Nemo is placed in a fish tank in the office of a dentist. He meets aquarium fish called the Tank Gang, led by Gill, a moorish idol. The fish learn that Nemo is to be given to the dentist's niece, Darla, who previously killed a fish by constantly shaking its bag. Gill then reveals his plan to escape, jamming the tank's filter. The fish would be placed in plastic bags so that the dentist can clean the tank, and then they would roll out the window and into the harbor. Nemo attempts to jam the filter, but fails, almost getting himself killed in the process. Near the harbor, a pelican, Nigel, flies to the dentist's office and brings news of Marlin's adventure. Inspired by his father's determination, Nemo makes a second attempt to jam the filter. Unlike the first attempt, he is able to successfully render the filter useless, but to the tank gang's dismay, the dentist installs a new high-tech filter before they can escape. After leaving the Current, Marlin and Dory are engulfed by a blue whale. Inside the whale's mouth, Marlin desperately tries to escape, while Dory communicates with the whale, which carries them to Sydney Harbour and expels them through his blowhole. They meet Nigel, and after helping the pair escape from a massive flock of seagulls, he takes them to the dentist's office. Darla has just arrived and the dentist is handing Nemo to her. Nemo plays dead to save himself as Nigel arrives, causing Darla to scream. Upon seeing Nemo, Marlin mistakenly believes he is dead, before Nigel is violently thrown out. In despair, Marlin leaves Dory and begins to swim home. Gill helps Nemo escape into a drain that leads to the ocean. Dory loses her memory and becomes confused, and meets Nemo, who reaches the ocean. Eventually, Dory's memory returns after she reads the word "Sydney" on a drainpipe. 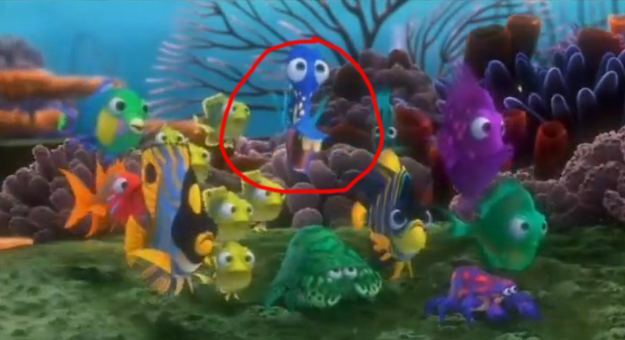 She reunites Nemo with Marlin, but she is caught in a fishing net with a school of grouper. Nemo enters the net and orders the group to swim downward to break the net, enabling them to escape. After returning home, Nemo leaves for school with Crush's son Squirt as Marlin recounts his adventures to the other parents. After they express skepticism towards his story, the sharks return after escorting Dory to the reef. She and Marlin proudly watch Mr. Ray carry Nemo and his friends to school. In a pre-credits sequence, the high-tech filter in the dentist's tank breaks down, and the Tank Gang escape to the harbor. Bloat realizes that they now have to find a way to get out of their plastic bags. After the credits, the Anglerfish lures a tiny guppy towards it, only for the guppy to eat the Anglerfish in a single bite and swim away. The inspiration for Nemo sprang from multiple experiences, going back to director Andrew Stanton's childhood, when he loved going to the dentist to see the fish tank, assuming that the fish were from the ocean and wanted to go home. In 1992, shortly after his son was born, he and his family took a trip to Six Flags Discovery Kingdom (which was called Marine World at the time). There, after seeing the shark tube and various exhibits, he felt that the underwater world could be done beautifully in computer animation. Later, in 1997, he took his son for a walk in the park, but realized that he was overprotecting him and lost an opportunity to have a father-son experience that day. In addition, clownfish are colourful, but do not tend to come out of an anemone often. For a character who has to go on a dangerous journey, Stanton felt a clownfish was the perfect type of fish for the character. Pre-production of the film began in early 1997. Stanton began writing the screenplay during the post-production of A Bug's Life. 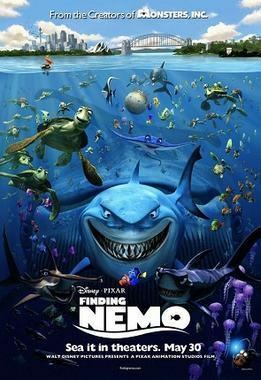 As a result, Finding Nemo began production with a complete screenplay, something that co-director Lee Unkrich called "very unusual for an animated film". The artists took scuba diving lessons to study the coral reef. The idea for the initiation sequence came from a story conference between Andrew Stanton and Bob Peterson while they were driving to record the actors. Stanton was inspired to cast Ellen DeGeneres when he watched an episode of Ellen in which he saw her "change the subject five times before finishing one sentence". The pelican character named Gerald (who in the final film ends up swallowing and choking on Marlin and Dory) was originally a friend of Nigel. They were going to play against each other with Nigel being neat and fastidious and Gerald being scruffy and sloppy. The filmmakers could not find an appropriate scene for them that did not slow the pace of the picture, so Gerald's character was minimized. Stanton himself provided the voice of Crush the sea turtle. He originally did the voice for the film's story reel, and assumed they would find an actor later. When Stanton's performance became popular in test screenings, he decided to keep his performance in the film. He recorded all his dialogue while lying on a sofa in Unkrich's office. Crush's son Squirt was voiced by Nicholas Bird, the young son of fellow Pixar director Brad Bird. According to Stanton, the elder Bird was playing a tape recording of his young son around the Pixar studios one day. Stanton felt the voice was "this generation's Thumper" and immediately cast Nicholas. Megan Mullally was originally going to provide a voice in the film. According to Mullally, the producers were dissatisfied to learn that the voice of her character Karen Walker on the television show Will & Grace was not her natural speaking voice. The producers hired her anyway, and then strongly encouraged her to use her Karen Walker voice for the role. When Mullally refused, she was dismissed. To ensure that the movements of the fish in the film were believable, the animators took a crash course in fish biology and oceanography. They visited aquariums, went diving in Hawaii and received in-house lectures from an ichthyologist. As a result, Pixar's animator for Dory, Gini Cruz Santos, integrated "the fish movement, human movement, and facial expressions to make them look and feel like real characters." The film was dedicated to Glenn McQueen, a Pixar animator who died of melanoma in October 2002. Finding Nemo shares many plot elements with Pierrot the Clownfish, a children's book published in 2002, but allegedly conceived in 1995. The author, Franck Le Calvez, sued Disney for infringement of his intellectual rights and to bar Finding Nemo merchandise in France. The judge ruled against him, citing the color differences between Pierrot and Nemo. A video game based on the film was released in 2003, for PC, Xbox, PS2, GameCube and Game Boy Advance. The goal of the game is to complete different levels under the roles of Nemo, Marlin or Dory. It includes cut scenes from the movie, and each clip is based on a level. It was also the last Pixar game developed by Traveller's Tales. Upon release, the game received mixed reviews. A Game Boy Advance sequel, titled Finding Nemo: The Continuing Adventures, was released in 2004. Finding Nemo received universal acclaim. The review aggregator website Rotten Tomatoes reported a 99% approval rating, with a rating average of 8.7/10, based on 255 reviews. The site's consensus reads: "Breathtakingly lovely and grounded by the stellar efforts of a well-chosen cast, Finding Nemo adds another beautifully crafted gem to Pixar's crown." Another review aggregation website, Metacritic, which assigns a normalized rating out of 100 top reviews from mainstream critics, calculated a score of 90 out of 100, based on 38 reviews, indicating "universal acclaim." Roger Ebert gave the film four out of four stars, calling it "one of those rare movies where I wanted to sit in the front row and let the images wash out to the edges of my field of vision". Broadway star Nathan Lane, who was the voice of Timon the meerkat in The Lion King, has said Finding Nemo was his favorite animated film. Ed Park of The Village Voice gave the film a positive review, saying "It's an ocean of eye candy that tastes fresh even in this ADD-addled era of SpongeBob SquarePants." Mark Caro of the Chicago Tribune gave the film four out of four stars, saying "You connect to these sea creatures as you rarely do with humans in big-screen adventures. The result: a true sunken treasure." Hazel-Dawn Dumpert of L.A. Weekly gave the film a positive review, saying "As gorgeous a film as Disney's ever put out, with astonishing qualities of light, movement, surface and color at the service of the best professional imaginations money can buy." Jeff Strickler of the Star Tribune gave the film a positive review, saying it "proves that even when Pixar is not at the top of its game, it still produces better animation than some of its competitors on their best days." Gene Seymour of Newsday gave the film three and a half stars out of four, saying "The underwater backdrops take your breath away. No, really. They're so lifelike, you almost feel like holding your breath while watching." Rene Rodriguez of the Miami Herald gave the film four out of four stars, saying "Parental anxiety may not be the kind of stuff children's films are usually made of, but this perfectly enchanting movie knows how to cater to its kiddie audience without condescending to them." Kenneth Turan of the Los Angeles Times gave the film three and a half stars out of five, saying "The best break of all is that Pixar's traditionally untethered imagination can't be kept under wraps forever, and "Nemo" erupts with sea creatures that showcase Stanton and company's gift for character and peerless eye for skewering contemporary culture." Stephen Holden of The New York Times gave the film four out of five stars, saying "Visual imagination and sophisticated wit raise Finding Nemo to a level just below the peaks of Pixar's Toy Story movies and Monsters, Inc.." Terry Lawson of the Detroit Free Press gave the film three out of four stars, saying "As we now expect from Pixar, even the supporting fish in "Finding Nemo" are more developed as characters than any human in the Mission: Impossible movies." Claudia Puig of USA Today gave the film three and half stars out of four, saying "Finding Nemo is an undersea treasure. The most gorgeous of all the Pixar films — which include Toy Story 1 and 2, A Bug's Life and Monsters, Inc. —Nemo treats family audiences to a sweet, resonant story and breathtaking visuals. It may lack Monsters, Inc.'s clever humor, but kids will identify with the spunky sea fish Nemo, and adults will relate to Marlin, Nemo's devoted dad." Bruce Westbrook of the Houston Chronicle gave the film an A-, saying "Finding Nemo lives up to Pixar's high standards for wildly creative visuals, clever comedy, solid characters and an involving story." Tom Long of The Detroit News gave the film an A-, saying "A simple test of humanity: If you don't laugh aloud while watching it, you've got a battery not a heart." Lou Lumenick of the New York Post gave the film four out of four stars, saying "A dazzling, computer-animated fish tale with a funny, touching script and wonderful voice performances that make it an unqualified treat for all ages." Moira MacDonald of The Seattle Times gave the film four out of four stars, saying "Enchanting; written with an effortless blend of sweetness and silliness, and animated with such rainbow-hued beauty, you may find yourself wanting to freeze-frame it." Daphne Gordon of the Toronto Star gave the film four out of five stars, saying "One of the strongest releases from Disney in years, thanks to the work of Andrew Stanton, possibly one of the most successful directors you've never heard of." Ty Burr of The Boston Globe gave the film three and a half stars out of four, saying "Finding Nemo isn't quite up there with the company's finest work -- there's finally a sense of formula setting in -- but it's hands down the best family film since Monsters, Inc." C.W. Nevius of The San Francisco Chronicle gave the film four out of four stars, saying "The visuals pop, the fish emote and the ocean comes alive. That's in the first two minutes. After that, they do some really cool stuff." Ann Hornaday of The Washington Post gave the film a positive review, saying "Finding Nemo will engross kids with its absorbing story, brightly drawn characters and lively action, and grown-ups will be equally entertained by the film's subtle humor and the sophistication of its visuals." David Ansen of Newsweek gave the film a positive review, saying "A visual marvel, every frame packed to the gills with clever details, Finding Nemo is the best big-studio release so far this year." Richard Corliss of Time gave the film a positive review, saying "Nemo, with its ravishing underwater fantasia, manages to trump the design glamour of earlier Pixar films." Lisa Schwarzbaum of Entertainment Weekly gave the film an A, saying "In this seamless blending of technical brilliance and storytelling verve, the Pixar team has made something as marvelously soulful and innately, fluidly American as jazz." Carrie Rickey of The Philadelphia Inquirer gave the film three out of four stars, saying "As eye-popping as Nemo's peepers and as eccentric as this little fish with asymmetrical fins." David Germain of the Associated Press gave the film a positive review, saying "Finding Nemo is laced with smart humor and clever gags, and buoyed by another cheery story of mismatched buddies: a pair of fish voiced by Albert Brooks and Ellen DeGeneres." Anthony Lane of The New Yorker gave the film a positive review, saying "The latest flood of wizardry from Pixar, whose productions, from Toy Story onward, have lent an indispensable vigor and wit to the sagging art of mainstream animation." The 3D re-release prompted a retrospective on the film nine years after its initial release. Stephen Whitty of the Newark Star-Ledger described it as "a genuinely funny and touching film that, in less than a decade, has established itself as a timeless classic." On the 3D re-release, Lisa Schwarzbaum of Entertainment Weekly wrote that its emotional power was deepened by "the dimensionality of the oceanic deep" where "the spatial mysteries of watery currents and floating worlds are exactly where 3D explorers were born to boldly go". During its original theatrical run, Finding Nemo grossed $339,714,978 in North America, and $559,492,275 in other countries, for a worldwide total of $899.2 million. It is currently the thirty-fifth highest-grossing film, the seventh highest-grossing animated film, and the second highest-grossing film of 2003, behind The Lord of the Rings: The Return of the King. Worldwide, it was the highest-grossing Pixar film, up until 2010, when Toy Story 3 surpassed it. The film sold an estimated 56,337,500 tickets in the US in its initial theatrical run. In North America, Finding Nemo set an opening weekend record for an animated feature, making $70,251,710 (first surpassed by Shrek 2) and ended up spending 11 weeks in the top 10 domestically (including 7 weeks in the top 5), remaining there until August 14. It became the highest-grossing animated film in North America ($339.7 million), outside North America ($528.2 million), and worldwide ($867.9 million), in all three occasions out-grossing The Lion King. In North America, it was surpassed by both Shrek 2 in 2004 and Toy Story 3 in 2010. After the re-release of The Lion King in 2011, and then Despicable Me 2 and Frozen in 2013, Minions in 2015, Zootopia, its sequel Finding Dory in 2016, and Despicable Me 3 in 2017, passed it, it stands as the ninth highest-grossing animated film in these regions. Outside North America, it stands as the fifth highest-grossing animated film. Worldwide, it now ranks fourth among animated films. The film had impressive box office runs in many international markets. In Japan, its highest-grossing market after North America, it grossed ¥11.2 billion ($102.4 million), becoming the highest-grossing foreign animated film in local currency (yen). It has only been surpassed by Frozen (¥12.1 billion). Following in biggest grosses are the U.K., Ireland and Malta, where it grossed £37.2 million ($67.1 million), France and the Maghreb region ($64.8 million), Germany ($53.9 million), and Spain ($29.5 million). After the success of the 3D re-release of The Lion King, Disney re-released Finding Nemo in 3D on September 14, 2012, with a conversion cost estimated to be below $5 million. For the opening weekend of its 3D re-release in North America, Finding Nemo grossed $16.7 million, debuting at the No. 2 spot behind Resident Evil: Retribution. The film earned $41.1 million in North America and $31.0 million internationally, for a combined total of $72.1 million, and a cumulative worldwide total of $940.3 million. Finding Nemo won the Academy Award and Saturn Award for Best Animated Film. It also won the award for Best Animated Film at the Kansas City Film Critics Circle Awards, the Las Vegas Film Critics Society Awards, the National Board of Review Awards, the Online Film Critics Society Awards, and the Toronto Film Critics Association Awards. The film received many other awards, including: Kids Choice Awards for Favorite Movie and Favorite Voice from an Animated Movie (Ellen DeGeneres), and the Saturn Award for Best Supporting Actress (Ellen DeGeneres). The film was also nominated for two Chicago Film Critics Association Awards, for Best Picture and Best Supporting Actress (Ellen DeGeneres), a Golden Globe Award for Best Motion Picture – Musical or Comedy, and two MTV Movie Awards, for Best Movie and Best Comedic Performance (Ellen DeGeneres). In June 2008, the American Film Institute revealed its "Ten Top Ten", the best 10 films in 10 "classic" American film genres, after polling over 1,500 people from the creative community. Finding Nemo was acknowledged as the 10th best film in the animation genre. It was the most recently released film among all 10 lists, and one of only three movies made after the year 2000 (the others being The Lord of the Rings: The Fellowship of the Ring and Shrek). The film's use of clownfish prompted mass purchase of the fish breed as pets in the United States, even though the story portrayed the use of fish as pets negatively and suggested that saltwater aquariums are notably tricky and expensive to maintain. The demand for clownfish was supplied by large-scale harvesting of tropical fish in regions like Vanuatu. The Australian Tourism Commission (ATC) launched several marketing campaigns in China and the United States to improve tourism in Australia, many of them utilizing Finding Nemo clips. 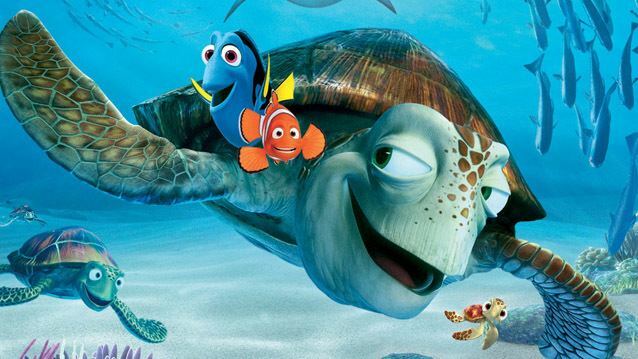 Queensland used Finding Nemo to draw tourists to promote its state for vacationers. According to National Geographic, "Ironically, Finding Nemo, a movie about the anguish of a captured clownfish, caused home-aquarium demand for them to triple." The reaction to the film by the general public has led to environmental devastation for the clownfish, and has provoked an outcry from several environmental protection agencies, including the Marine Aquarium Council, Australia. The demand for tropical fish skyrocketed after the film's release, causing reef species decimation in Vanuatu and many other reef areas. After seeing the film, some aquarium owners released their pet fish into the ocean, but failed to release them into the correct oceanic habitat, which introduced species that are harmful to the indigenous environment, a practice that is harming reefs worldwide. Finding Nemo was released on VHS and DVD on November 4, 2003. The DVD release included an original short film, Exploring the Reef, and the short animated film, Knick Knack (1989). The film was then released on both Blu-ray and Blu-ray 3D on December 4, 2012, with both a 3-disc and a 5-disc set. Finding Nemo was the first Pixar film not to be scored by Randy Newman. The original soundtrack album, Finding Nemo, was scored by Thomas Newman, his cousin, and released on May 20, 2003. The album was nominated for the Academy Award for Original Music Score, losing to The Lord of the Rings: The Return of the King. Finding Nemo has inspired numerous attractions and properties at Disney Parks around the world, including: Turtle Talk with Crush, which opened in 2004 at Epcot, 2005 in Disney California Adventure Park, 2008 in Hong Kong Disneyland, and 2009 in Tokyo DisneySea; Finding Nemo Submarine Voyage, which opened in 2007 in Disneyland Park; The Seas with Nemo & Friends, which opened in 2007 at Epcot; Finding Nemo – The Musical, which opened in 2007 in Disney's Animal Kingdom; and Crush's Coaster, which opened in 2007 at Walt Disney Studios Park. In 2005, after disagreements between Disney's Michael Eisner and Pixar's Steve Jobs over the distribution of Pixar's films, Disney announced that they would be creating a new animation studio, Circle 7 Animation, to make sequels to the seven Disney-owned Pixar films (which consisted of the films released between 1995 and 2006). The studio had put Toy Story 3 and Monsters University into development, and had hired screenwriter Laurie Craig to write a draft for Finding Dory. Circle 7 was subsequently shut down after Robert Iger replaced Eisner as CEO of Disney and arranged the acquisition of Pixar. In July 2012, it was reported that Andrew Stanton was developing a sequel to Finding Nemo, to be titled Finding Dory, with Victoria Strouse writing the script, and the film scheduled to be released in 2016. The same day the news of a potential sequel broke, Stanton called into question the accuracy of the reports. The message said, "Didn't you all learn from Chicken Little? Everyone calm down. Don't believe everything you read. Nothing to see here now. #skyisnotfalling". According to the report by The Hollywood Reporter published in August 2012, Ellen DeGeneres was in negotiations to reprise her role of Dory. In September 2012, Stanton confirmed, saying, "What was immediately on the list was writing a second Carter movie. When that went away, everything slid up. I know I'll be accused by more sarcastic people that it's a reaction to Carter not doing well, but only in its timing, but not in its conceit". In February 2013, it was confirmed by the press that Albert Brooks would reprise the role of Marlin in the sequel. In April 2013, Disney announced the sequel Finding Dory, confirming that DeGeneres and Brooks would be reprising their roles as Dory and Marlin, respectively. It was scheduled to be released on November 25, 2015, but the film's ending was revised after Pixar executives viewed Blackfish. On September 18, 2013, it was announced that the film would be pushed back to a UK July 29, 2016 release. Pixar's The Good Dinosaur was moved to the November 25, 2015 slot to allow more time for production of the film.